This book was provided to me by Harlequin TEEN in exchange for an honest review. This in no way affected my opinion of the book or my review. Thank you Harlequin TEEN! Cinderella has always been a favorite fairy tale for me. The first musical I ever saw, though on TV, was Rodgers and Hammerstein's Cinderella. I've read the original story. I've seen the Disney version at least 200 times. And as a former ballerina, you can bet that it was my favorite ballet, second only to The Nutcracker. I'll take it in whatever form it comes. And this fall, when I go back to NYC, the number one item on my to-do list is to see it live. 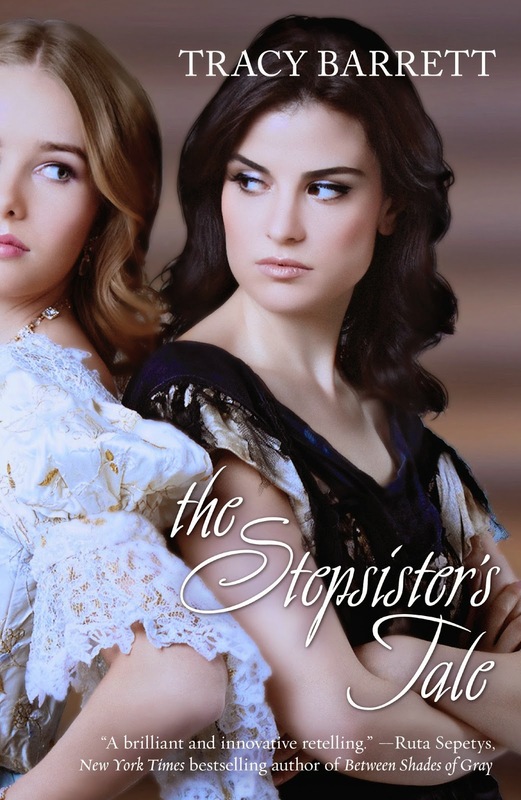 But I'm happy to report that Tracy Barrett's The Stepsister's Tale breaks with the tradition of mostly blah Cinderella retellings and brings a whole new spin to the story I've always loved and shockingly, made really annoyed with the Cinderella character, Isabella. I didn't think it was possible. But this story evoked all sorts of emotions in me and it made me look at the other characters in ways I never had in any other translation of this classic fable. Retellings are challenging for both the writer and the reader. There needs to be some sort of thread that remains the same, but it can't just be the original stoy regurgitated, either. And readers can get bored if it's just the same old story they knew. Most of the retellngs I've read have taken the story to new places or delivered them in a new way altogether: a dystopian world, a high fantasy landscape, an alien ruled planet. But The Stepsister's Tale is a very literal retelling -- it's set in the same type of place and time period that the Cinderella stories we know so well take place in. In this way, it's very true to its roots -- but Barrett manages to do this without it seeming stale. The thread of truth from the original story is strong. But when your subsconscience starts to expect a certain event or exchange that happened in the original story, it happens, but with a twist or change. The Stepsister's Tale deals with misconceptions, reminding us that behind every fairy tale are many untruths. In a wicked stepmother, we find a woman who is consumed by grief and whose world has shattered, over and over again. A charming prince turns out to be a loser in tinfoil, looking for a sugar mama to finance his white horse. Ugly stepsisters are actually just two hardworking young girls trying to keep an entire family afloat, bearing the weight of responsibilities that most children couldn't, and who are quite simply haggard, exhasted, and worn through by trying to keep a palace from falling apart around them. And a heroine turns out to be a spoiled girl who had never been taught the harsh realities of life until tragedy struck, and she was ill-equipped to handle her new circumstances. But I think the best part about this story is that it challenges the notion of happily ever after and that a girl riding away in a white carriage, now a princess, is not the only option. In this case, the happily ever after came from four women, all who are living lives that they didn't plan for, finding out how to level with each other, even after multiple tragedies and hurtful, petty vendettas have been waged. The Stepsister's Tale was a quick read. If it wasn't for the fact that I've been sick and exhausted, I would'e finished it in one night. Instead, it tookk two nights. It was engaging, fun, and a book I would recommend to anyone. It wasn't necessarily a challenging read and it is short, but I was book I just simply enjoyed. I couldn't find anything wrong with it and was sad when it ended because I felt a real connection to the characters. For these reasons, I give it five hearts!